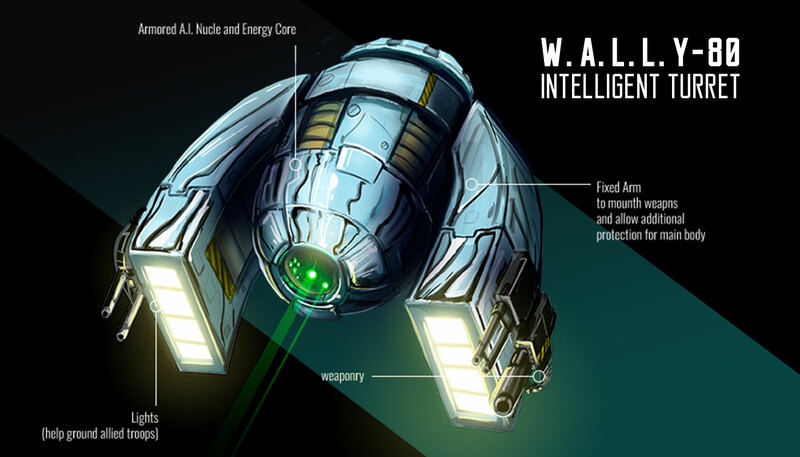 The mobile turret Warfare Advanced Levitation Year-80 (W.A.L.L.Y-80) is the first robot equipped with an Advanced Artificial Intelligence which allows it more accurate targeting and strategies against the enemies it faces. It is important to note that Advances A.I. are not more than a very complex set of instructions and protections and it doesn’t give the machine a real, human-like intelligence. The robot turret has a Magnetic Energy Core that powers it up and also allows it to fly above ground, making it very mobile and dangerous, like drones. This propulsion method doesn’t support much weight so the turret usually carries medium sized machine-guns and light armor. This unit can be upgraded with a leg attachment allowing it to carry heavier weapons and thick armor plates, making it less mobile but more dangerous. 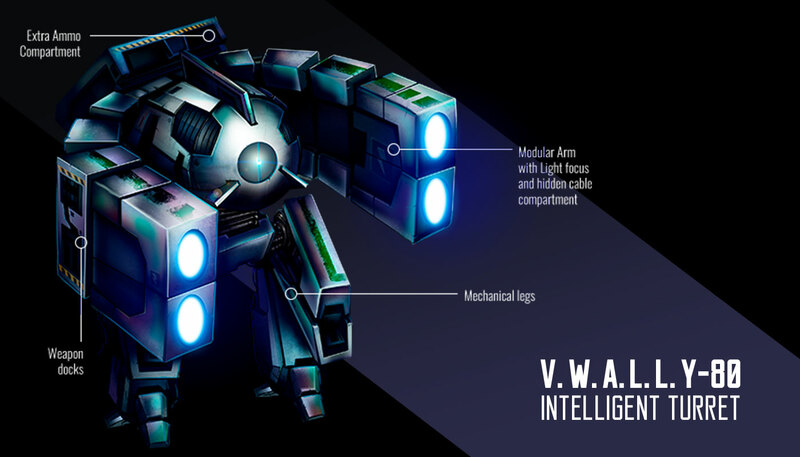 The Variable Warfare Advanced Levitation Year-80 (V.W.A.L.L.Y-80) sentry robot is the latest improvement over the already effective W.A.L.L.Y-80 automatized levitation turret. This model has an improved energy core, armor plate and is capable to release a huge burst of energy to contain masses using a hidden compartment in its arms where several cables are launch towards organic enemies, this works in a similar way to a tazer. With this measure it can kill several enemies at once but it’s rarely used as it immobilizes the robot while the battery recharges and the system is restored. This robot can be equipped with any type of medium and heavy weapons. Despite being based in the W.A.L.L.Y-80 robot this version can’t levitate with the internal magnetic energy core and always needs to be attached to a leg mechanism to move.